2/28/09 decreases should be completed as indicated in chart. Pattern text indicates decreases begin later, but the chart is correct. 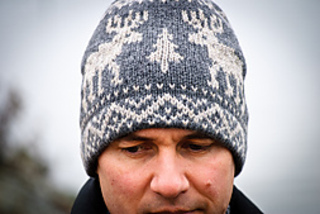 I’ve been lusting over this amazing hat - the official hat of 2010 Team USA - from the Ralph Lauren website since I first saw it mentioned (I no longer recall by which of my favourite knit-bloggers/tweeters). But $65 is a bit of an absurd price-tag, even for designer knitwear. So I spent a cozy morning in bed with my cup of coffee and reverse-engineered the pattern from the photos. 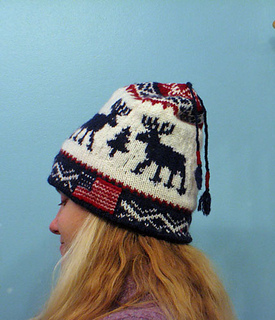 So, I bring you, the Team USA Reindeer pattern! 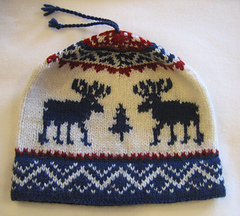 There is some debate about whether these are reindeer or moose. Ralph calls them moose, but several antler-experts have written to inform me that they are in fact reindeer. 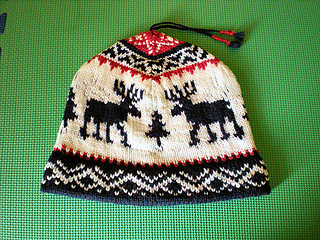 I’ve lived in San Diego my whole life, so I know very little about the subtle nuances between moose and reindeer antlers -- but I DO know that this is an effing adorable hat.